We just got back from the National School Board Association’s (NSBA) 73rd Annual Conference and Expo where Ketchum Midwest had reached out to us to aid in marketing their Kleenex brand’s ‘Back to School’ campaign. Ketchum ranks amongst the largest and most geographically diverse public relation agencies and we were very excited to be working with them. The conference was attended by school board members, teachers, and school officials. The goal was to make an interactive space where guests could have fun while learning about the power of Kleenex tissue as a factor in helping making schools healthier for students. Not only did we succeed, we also took home ‘Best in Show’! Check out some pictures of what won us the award! At the end of the day the kids are what matter the most. 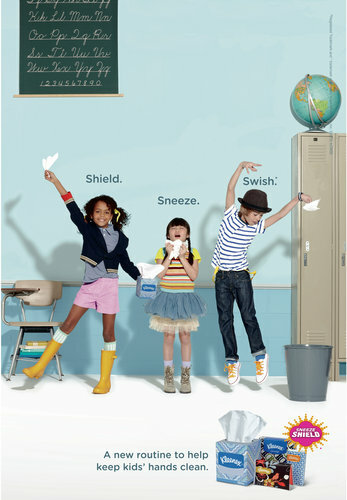 We wanted to create a statement about the Kleenex brand in the classroom and how their products would benefit them. Our booth was a 20’x20’ island in the middle of the tradeshow, which was filled with other vendors. We designed a space that replicated a classroom; complete with chairs, a teachers desk, and, of course, a globe. Behind the TV, which was running the Kleenex brand’s ‘Shield. Sneeze. Swish.’ routine were 3 banners proudly displaying the Kleenex brand Logo. Modern event decoration makes a clean event that is professional yet striking. In between these banners was a display showing off the many variations of the Kleenex tissue box. Stringing together these 200 boxes was a labor of love but it gave the whole booth a ‘Wow’ factor. When creating displays, we at In The Event want to show off the brand while simultaneously creating something creative and artistic. Dr. Kleenex, Dr. Andrew Bakken from Kleenex brand R&D, engaged attendees with a demonstration comparing the quality of Kleenex products to competitor products. He distributed Kleenex tissues to half the crowd and the competitor’s tissue to the other half. After liquid was applied to the tissues the crowd was asked to sit down once their hand got wet. The attendees with Kleenex tissues were the last standing! They were all amazed how Kleenex tissue kept the liquid contained and not all over their hands. Attendees also had a lot of fun in the money booth, which is always a huge hit at any event. The NSBA supplied officials to judge everyone’s booths. The judging was based on professionalism, personality, guest interaction, function, and overall presentation. Our Kleenex brand booth was awarded ‘Best of Show’ for an island booth!